We’ve all talked about it, and we’ve definitely all felt it! As soon as I take down Christmas, I’m relishing the clean, pared down aesthetic. For awhile. And then, not so much. My house starts to feel pretty bare, and on top of that, it’s cold, it’s dreary, and it makes me long for spring. 1. Bring in the greens! As most of you know, I love green! It’s absolutely my favorite color, and I feel like it works year-round. However, it’s also a great choice for that in-between time we’re experiencing now. It’s a neutral, it harkens back to nature which is nice when there’s not a lot of green outside, and it makes your home more cheerful for sure! 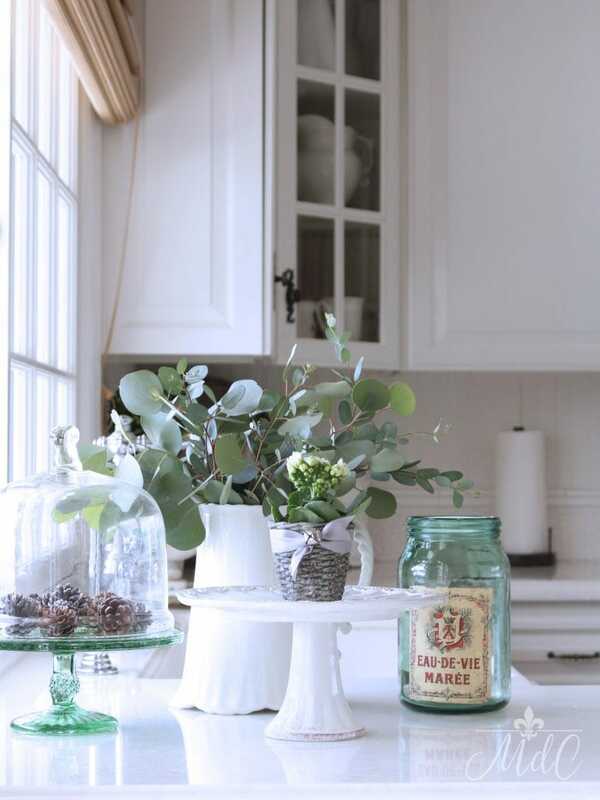 I love to bring in not only natural greens, but also green accessories. 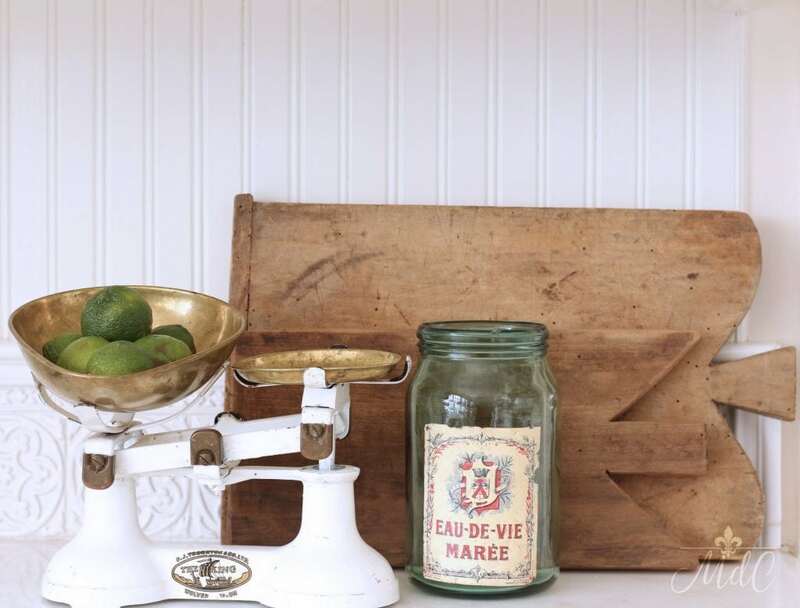 Here I added a vintage French jar I had, as well as a green cake plate from Target. 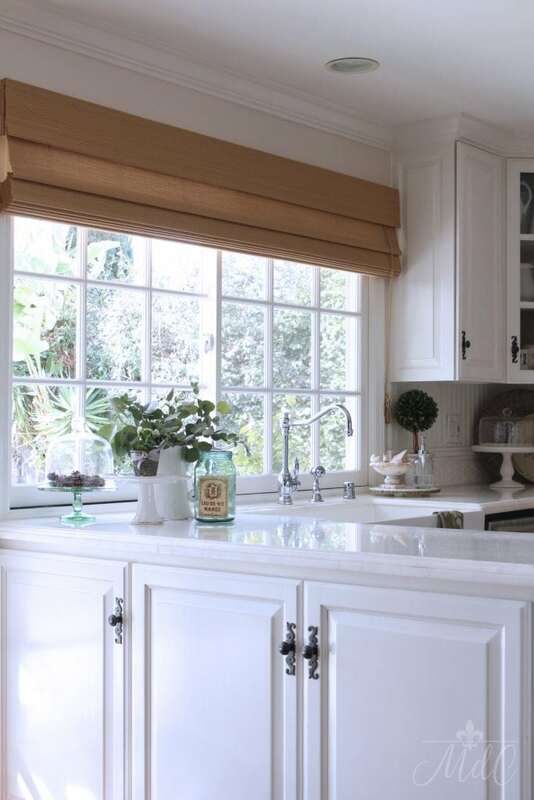 I love the pop it adds to my white kitchen! 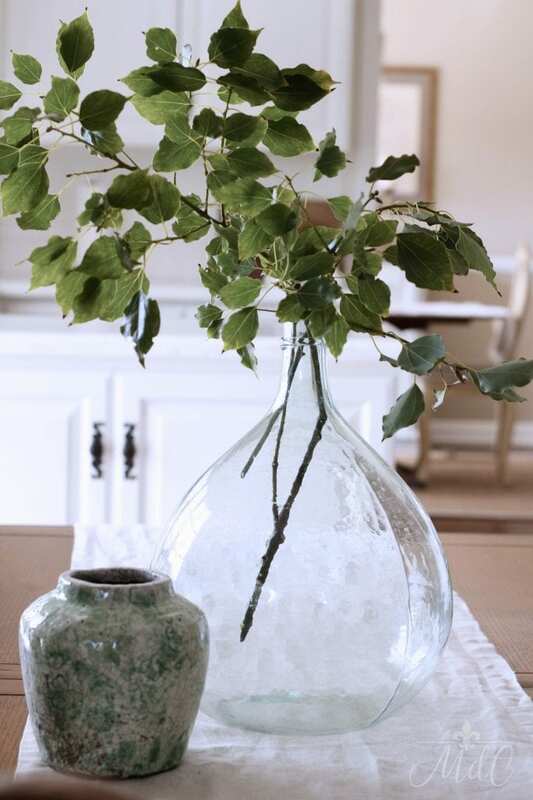 On the kitchen table, some green branches clipped from the yard live in my antique demijohn along with a small green vase to form a little vignette. Once I took down the Christmas decor on the mantel, it was really looking bare so I decided to re-style it a bit. Sometimes just moving things around, or borrowing from another room can make all the difference. I added a few more items to the mantel, and I love that it feels a little more balanced and full now. I went with neutrals, but I’d love to add some greens here, too, and I may still do that. And shop your house! The urn on the left has been on a shelf in my family room forever, and I moved it in here, plopped an orchid in it, and voilà! I also changed out my typical neutral pillows on the sofa for these green floral ones that usually live in the master bedroom. Pine cones are part of my Christmas decor, but they are also the only thing I don’t put away when I put those bins back in the attic. To me, they just scream winter! And yet they definitely work for these few months before spring comes. I purposely kept out the ones with “snow” on them as I loved the white. I have several sizes, from tiny to large and I scatter them everywhere. My small ones I’ve purchased and they are faux, but the real ones are free! Go scour your neighborhood or a park – there are usually tons on the ground! 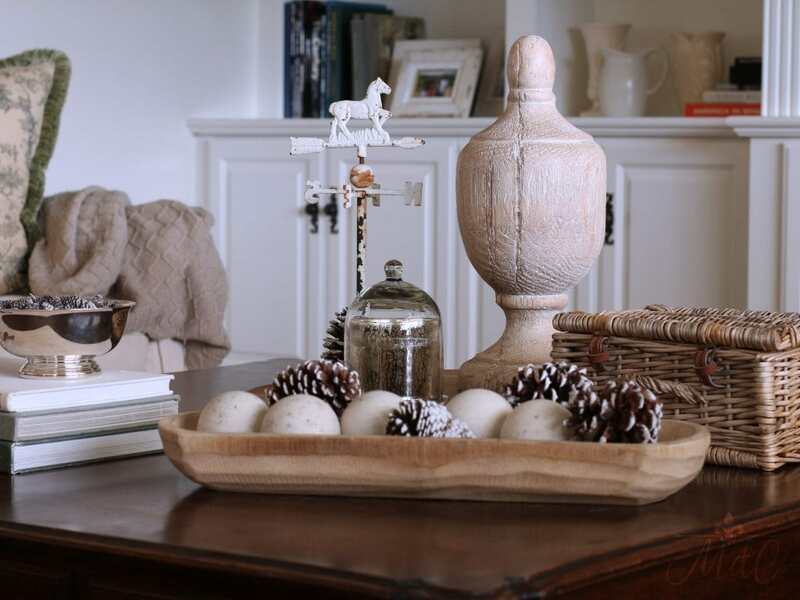 Large white pine cones in a wood bowl, and tiny pine cones in a vintage silver bowl spell winter on the coffee table. The basket also adds texture which is always nice, especially during a season when we crave that coziness texture can bring. 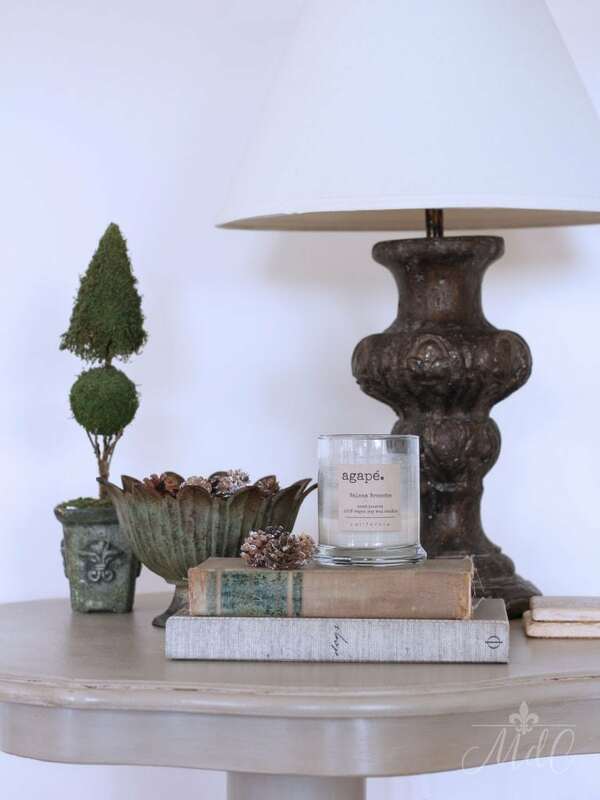 More pine cones on a side table. And some green books! 4. And Flowers, of Course! I love flowers all times of the year, but during the winter, they are kind of a necessity! Admittedly, they aren’t free, like in the spring and summer when I can clip them in my yard. But for a few dollars at the market, they are definitely worth it. They bring cheer and freshness during these shorter, darker days, and really, where can you get a week’s worth of that for $5 or $6? People spend that and more on a coffee everyday and that only lasts a few minutes! Also, eucalyptus. This is my favorite green, and it’s like $2 a bunch and lasts even longer than flowers! A win-win for sure! 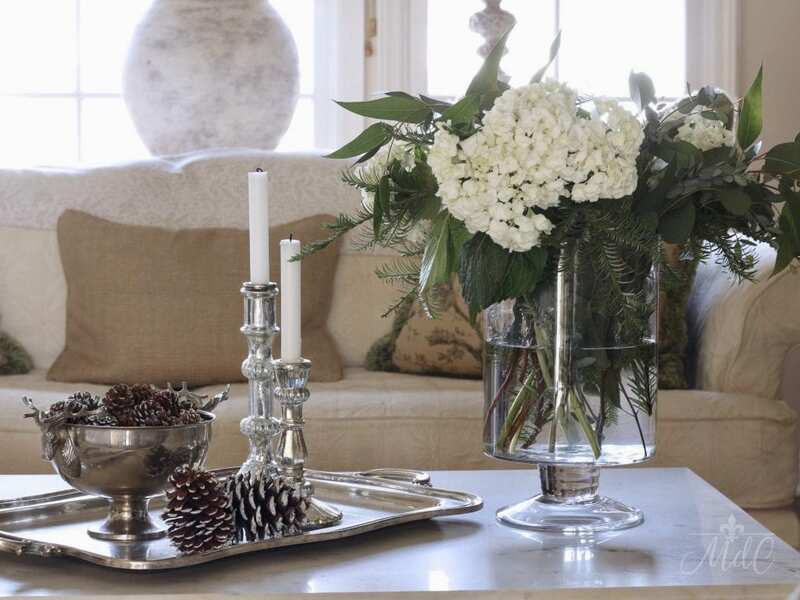 In the living room, I mixed some hydrangeas with pine sprigs and eucalyptus. More pine cones live in a stag’s head silver bowl.. I don’t use faux often, but in the winter sometimes it’s necessary. I loved these branches because the weathered green of the oak leaves looks so real! Either way, whether the florals are fresh or faux, they add that life that we need so much this time of year. 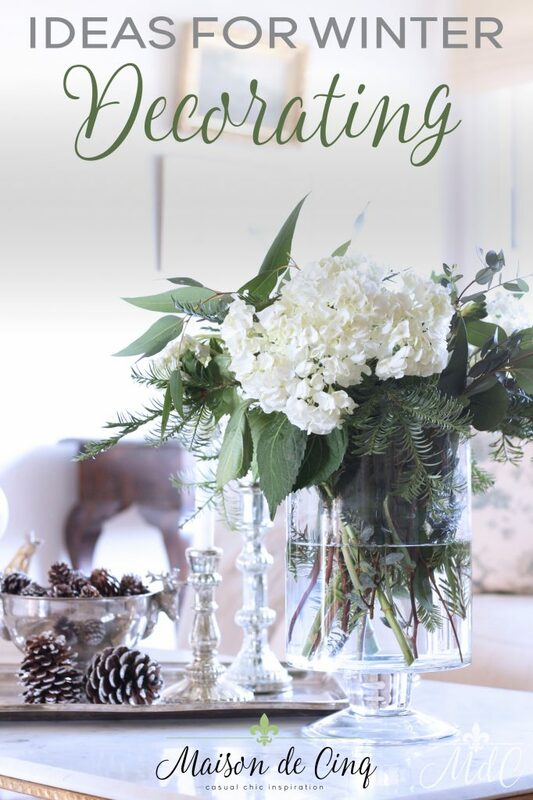 Hopefully, I’ve inspired you with some winter decorating ideas that you can incorporate into your own home. At least until spring, and then we’ll all be bringing out the brights and the tulips! I love it all! I also am using green throughout winter mixed in with my neutrals. Green is my favorite color and I love that it will transtion into spring. Thank you so much for stopping by and for taking the time to comment! And happy new year to you as well! Thanks so much Kippi! so glad you like them! 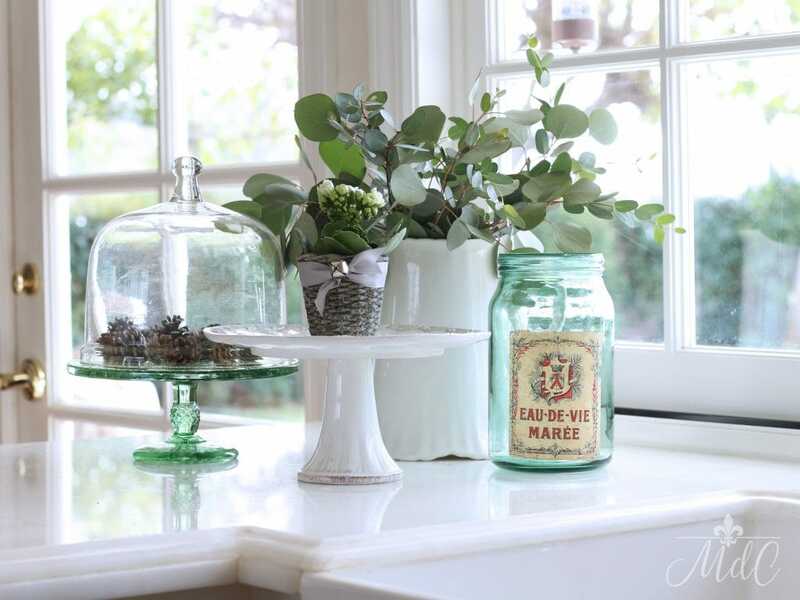 I love green too and you have done such a beautiful job bringing into your lovely home! Happy New Year!! Thanks so much Holly! and Happy New Year to you! Hi Sheila, I am a new follower and I’m so glad I found your blog! We have a very similar style and you have helped me figure out a few quick changes to make for transitioning from Christmas to winter decor. We are hosting the appetizer portion of a progressive New Years Eve dinner party and I’m excited to incorporate some of your ideas! Happy New Year! This year my Christmas decor makes a quick and easy transformation to Winter. I used a lot of mercury glass,faux evergreens,boxwood and snowy owls. I just removed anything that screamed Christmas,added some white alstromeria to my white Amaryllis collection and put out a large bowl of silver pinecones that I had been using outsde. Also replaced my little Santa under a cloche to a faux white Lenten rose and created a winter vignette for my coffee table. Of course a faux fur throw and lots of candles will warm up January. Happy New Year. Kathy, it sounds like you have the winter decor covered for sure! I’m about to do mine tomorrow and the next day, and I’ll be doing the same! Thanks so much for stopping by – and Happy New Year! What a lovely home! I have some of the same items as you do…and I feel inspired. Love to come and see whats new on your site! Thanks! Hi Gretchen – and thank you!! I’m so glad you’ve been inspired by the blog – there’s nothing I love hearing more:) Hope you will consider subscribing so that you don’t miss any new updates or posts! Happy New Year! This is such a wonderful post to read first thing in the morning when I am planning on taking down my Christmas decorations…full of inspriration! It helps me know that it is OK to leave out the pine cones. Also gives me ideas of what to look for in the attic that I can pull down for winter decorating while I am putting away the holiday things. Thank you so much for stopping by and for taking the time to comment! Beautiful! 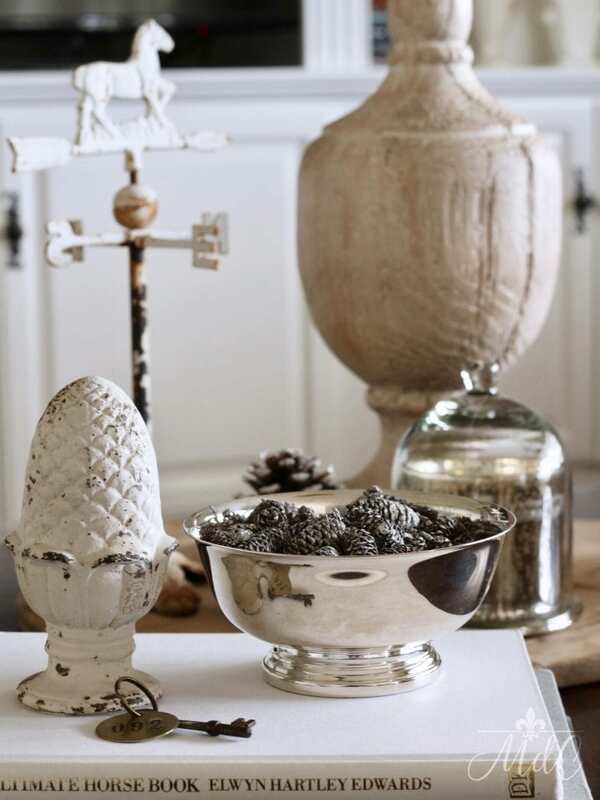 !….and there is nothing like taking a simple item such as a pine cone and place it in an elegant container…just love the pine cones in the silver bowl…rustic elegance indeed! That’s so sweet Shirley – thank you! And I couldn’t agree more! I love the juxtaposition of such simple items in a pretty bowl. Your home looks so gorgeous and I love all your natural elements! I so need to bring in greenery from my yard. I’ve come to the conclusion I need more vases! Btw, thanks so much for joining our Friday Friends Oarade Linky Patty, we so appreciate that you posted!!! Thank you so much Janine – you’re so kind! And yes, greenery is always good right?! Especially now! Thank you Norma! And thanks for coming over to the blog – I so appreciate it! Beautiful winter touches! Thank you for the inspiration! 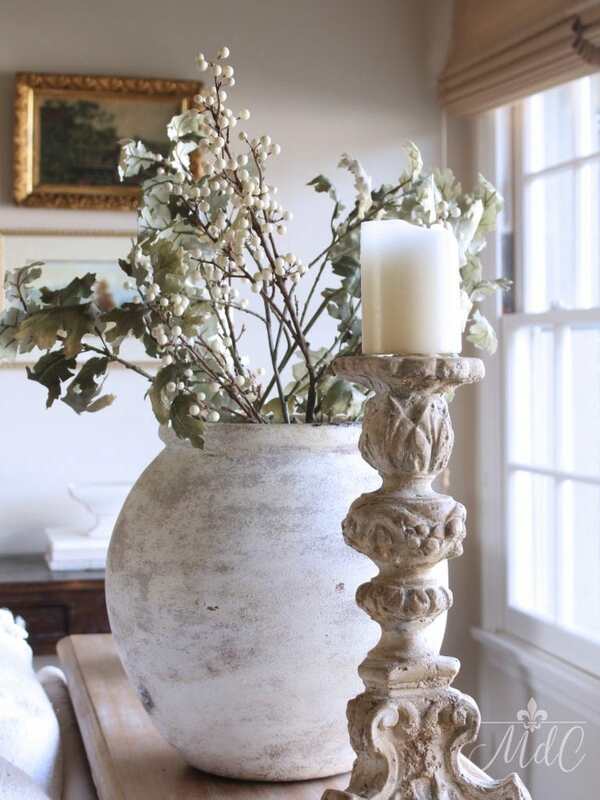 Can you share where your round vase is from (it looks concrete and has the Oak leaves in it)? Your mantle looks so beautiful! I love symmetry but am going to try to mix things up as you did, it’s very warm and welcoming! Hi Kelly! Thanks so much for your kind comment and for reaching out. You should be able to find that vase linked in the post, it was from Pottery Barn. Hope that helps! Oh gosh Sherry, what a wonderful comment to receive today! To hear from readers is always a wonderful thing, but when it’s a comment this kind, well, let’s just say you totally made my day! Thanks again and happy weekend to you! 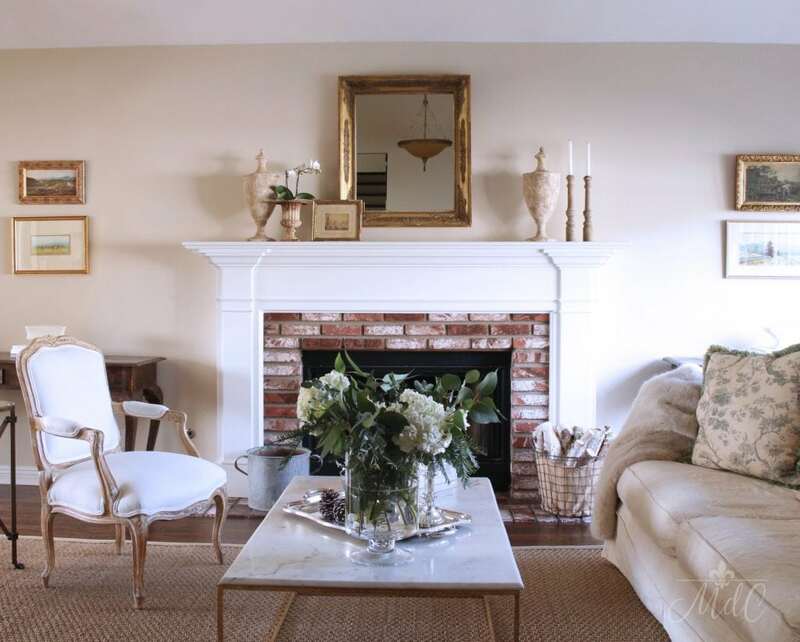 Beautiful home and warm, delightful ideas for decorating. Thank you! Great tips! I love your beautiful home and the resources you shared. Hi Deborah and thank you so much!